Here are some images that I snapped last night. Warning: some are graphic. The full photoset also contains images from the previous day. 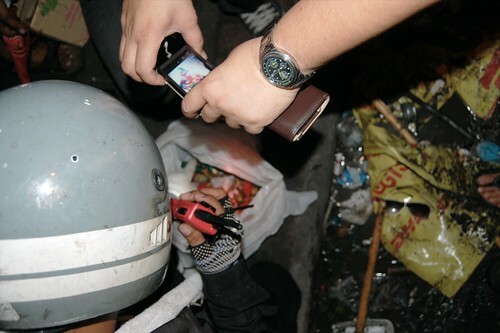 For context on the military crackdown, see the descriptions I posted on Twitter in real-time. The AP says 18 people have been killed in the clashes. Five soldiers and 13 civilians. For the latest news, here are stories from the NYT, WSJ, AP, and Reuters (1 — and 2). A cache of weapons on Phan Fah stage. The red shirts said they took the arms from soldiers. Captured soldiers being held on stage at Phan Fah bridge. I asked one of the red shirts what they would do with these men. He said they would be held until tomorrow (today — Sun.). About 10 min. after I took this photo, the men were lead to an area behind the stage, out of sight. A red shirt media liaison told me this man was the father of one of the protesters who was killed. The man’s son was 25 years old. 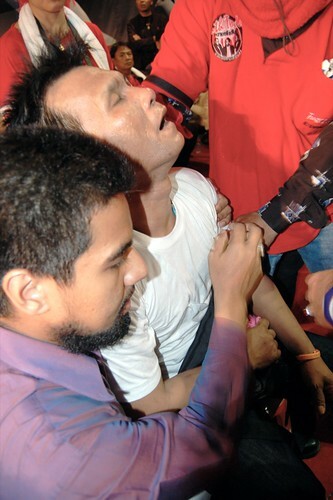 The man collapsed after crying over his son’s body. 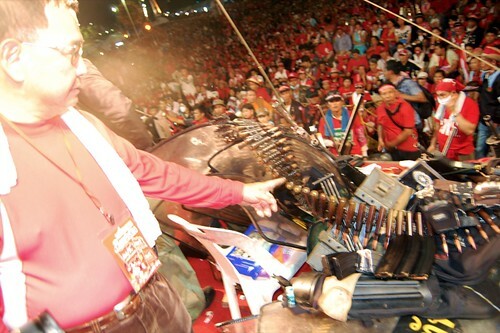 A red shirt protester poses with a riot shield. A plastic bag full of spent shell casings. 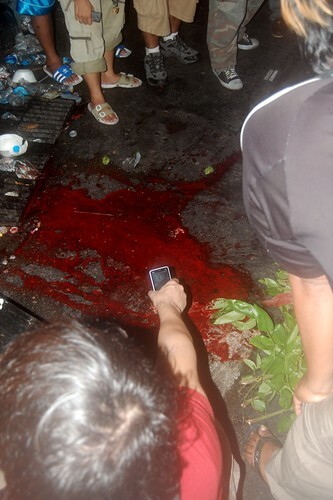 A pool of blood not far from Khao San Rd. 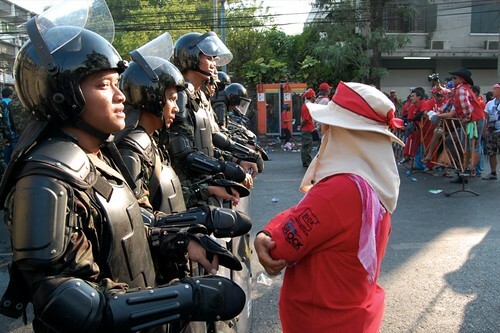 A red shirt woman speaks with soldiers near Makkawan. Wow Newley, great job. Be careful out there brother. Great photo journalism Newley. You were right there.